We thank to Dr Marek Havrda, former advisor to the Ministry of Finance of the Czech Republic, for fruitful methodological discussions during the course of this study, and to Dr James Shearer from the King’ Health Economics group at King’s College London for critically reviewing previous version of this manuscript. This study was supported by the Ministry of Finance of the Czech Republic and also by the project “Sustainability for the National Institute of Mental Health”, LO1611, Ministry of Education, Youth and Sports of the Czech Republic under the NPU I program. This study was partly founded by the Czech Ministry of Finance and conducted in order to enable informed decision making with regard to the prospective gambling-related legislative changes in the Czech Republic. Ministry of Finance had no role whatsoever as far as the design of the study, data analyses and data interpretation are concerned. Otherwise, authors declare that they have no conflict of interest. AHIC. (2013). Association of Health Insurance Companies in Czech Republic. http://www.szpcr.cz/index.php. Accessed 25 September 2014. APC. (1999). Australia’s Gambling Industries. Report no. 10. http://www.pc.gov.au/inquiries/completed/gambling/report. Accessed 2 September 2014. APC. (2010). Gambling, Productivity Commission, Government of Australia. Report no. 50. http://www.pc.gov.au/inquiries/completed/gambling-2009/report. Accessed 2 September 2014. CNB. (2014a). Kurzy devizového trhu—měsíční průměry: měna: AUD, množství: 1 [Foreign exchange rates—monthly averages: Currency: AUD, amount: 1]. Czech National Bank. https://www.cnb.cz/cs/financni_trhy/devizovy_trh/kurzy_devizoveho_trhu/prumerne_mena.jsp?mena=AUD. Accessed 12 September 2014. Cowlishaw, S., Merkouris, S., Dowling, N., Anderson, C., Jackson, A., & Thomas, S. (2012). Psychological therapies for pathological and problem gambling. The Cochrane Library. doi: 10.1002/14651858.CD008937.pub2. CSO. (2012). Obyvatelstvo podle Sčítání lidu, domů a bytů 2011 – Česká republika a kraje [Population according to Census of people, houses and flats 2011—Czech Republic and regions]. Czech Statistical Office. http://www.czso.cz/csu/2012edicniplan.nsf/kapitola/07000-12-n_2012-00t0. Accessed 8 August 2014. CSO. (2013a). Národní účty—4. čtvrtletí 2012: Slabá domácí poptávka příčinou poklesu HDP [National Accounts—Q4 quarter 2012: Weak domestic demand caused a decline of GDP]. Czech Statistical Office. http://www.czso.cz/csu/csu.nsf/informace/chdp031113.doc. Accessed 12 September 2014. CSO. (2013b). Průměrné mzdy—4. čtvrtletí 2012: Průměrnou mzdu zvýšily mimořádné odměny [Average wages—Q4 2012: The average wage was increased by extra bonuses]. Czech Statistical Office. http://www.czso.cz/csu/csu.nsf/informace/cpmz031113.doc. Accessed 12 September 2014. CSO. (2013c). Statistická ročenka České republiky 2013: 27. Soudnictví, Kriminalita, Nehody; 27-1. Pohyb agendy u okresních a krajských soudů [Statistical Yearbook of the Czech Republic 2013: 27. Justice, Crime, Accidents; 27-1 Administration movement at district and regional courts]. Czech Statistical Office. http://www.czso.cz/csu/2013edicniplan.nsf/kapitola/0001-13r_2013-2700. Accessed 24 September 2014. CSO. (2014). Inflace—druhy, definice, tabulky [Inflation – types, definitions, tables]. Czech Statistical Office. http://www.czso.cz/csu/redakce.nsf/i/mira_inflace. Accessed 12 September 2014. Hayward, K., et al. (2004). The costs and benefits of gaming. Nova Scotia Gaming Foundation. http://www.gpiatlantic.org/pdf/gambling/gamblingsumm.pdf. Accessed 23 July 2014. IHIS. (2014). Činnost praktických lékařů pro dospělé v roce 2013 [The activities of general practitioners for adults in 2013]. Aktuální informace Ústavu zdravotnických informací a statistiky České republiky [Current information from Institute of Health Information and Statistics of the Czech Republic]. Institute of Health Information and Statistics of the Czech Republic. http://www.uzis.cz/rychle-informace/cinnost-praktickych-lekaru-pro-dospele-roce-2013. Accessed 2 July 2014. Independent Gambling Authority. (2009). 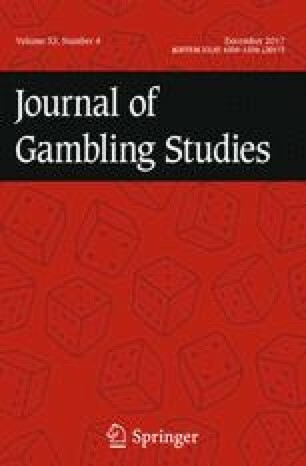 Social impacts of gambling: A comparative study. http://www.iga.sa.gov.au/pdf/research/SocialImpactsofGamblingAComparativeStudyApril2009-PublishedVersion.pdf. Accessed 20 August 2014. Kurzy.cz. (2015). EUR průměrné kurzy 2012, historie kurzů měn [EUR average exchange rates in 2012, the history of exchange rates]. http://www.kurzy.cz/kurzy-men/historie/EUR-euro/2012/. Accessed 15 October 2015. PCD. (2013). Návrh státního závěrečného účtu ČR za rok 2012. Část č. 1/28. The Parliament of the Czech Republic, Chamber of Deputies. http://www.psp.cz/sqw/text/tiskt.sqw?O=6&CT=1010&CT1=0. Accessed 2 September 2014. PSCR. (2013). Statistická ročenka Vězeňské služby České republiky: 2012 [Statistical Yearbook of the Prison Service of Czech Republic: Prague 2012]. Prison Service of Czech Republic. http://www.vscr.cz/client_data/1/user_files/19/file/spr%C3%A1vn%C3%AD/statistiky/Statistick%C3%A9%20ro%C4%8Denky/Ro%C4%8Denka%202012.pdf. Accessed 2 September 2014. Škrabal, J. (2013). Jaké je složení domácností v ČR [What is the structure of households in the Czech Republic]? Czech Statistical Office. http://www.czso.cz/csu/tz.nsf/i/jake_je_slozeni_domacnosti_v_cr20130307. Accessed 2 September 2014. Smith, G. J., & Wynne, H. J. (2000). The Gambling Literature in the Economic and Policy Domains. http://www.collectionscanada.gc.ca/eppparchive/100/200/300/alberta_gaming_res_inst/review_gambling_lit_eco/economic.pdf. Accessed 2 July 2014. The World Bank. (2013). GDP per capita, PPP. http://data.worldbank.org/indicator/NY.GDP.PCAP.PP.CD?page=2&order=wbapi_data_value_2013%20wbapi_data_value%20wbapi_data_value-last&sort=desc. Accessed 2 September 2014. The World Bank. (2015). GDP (current US$). http://data.worldbank.org/indicator/NY.GDP.MKTP.CD?page=3. Accessed 22 October 2015. Volberg, R. A. (1997). Gambling and Problem Gambling in Colorado. Report to the Colorado Department of Revenue. https://www.colorado.gov/pacific/sites/default/files/Problem_Gambling_prevalence_study.pdf. Accessed 2 July 2014. XE. (2015). XE Currency Converter. http://www.xe.com/currencyconverter/convert/?From=USD&To=AUD. Accessed 22 October 2014.